Who can resist picking up the maul and banging away on a Hi Striker? 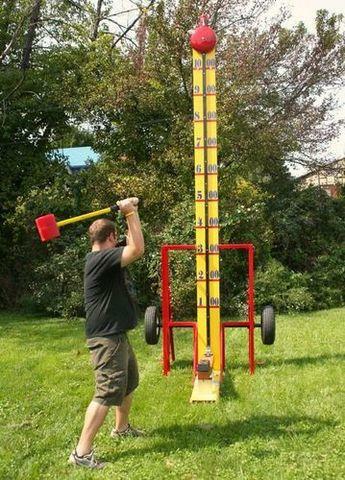 A high striker, also known as a strength tester, or strongman game, is an attraction used in funfairs, fundraisers, and carnivals. It operates by utilizing the lever where one end holds a puck attached to the tower and the other end is struck by the person or contestant using a hammer or mallet. The aim of players is to ring the bell suspended on top of the tower. If the lever is struck with enough force, the puck will raise high enough to hit the bell, indicating a success. Modern versions use a spring-loaded version of the lever, others use an enclosed striking mechanism. Operators entice people to try the high striker with phrases such as: "Step right up! ","Test your strength! ", or "Who are the men out of the boys?" Step right up and test your strength on the High Striker! It's the classic fairground game guaranteed to sort the men from the boys. Using the provided mallet, players must hit the base of the tower as hard as they can to raise the metal puck up to the large bell at the top of the tower. 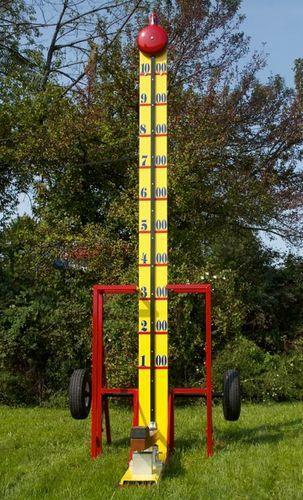 The High Striker (or strongman game, as it is sometimes known) is a popular choice for any fairground or fete as it always pulls a crowd and can also provide a great earnings potential. It is also a fantastic idea for any corporate or team building events where a fun competitive game is sure to be a big hit!